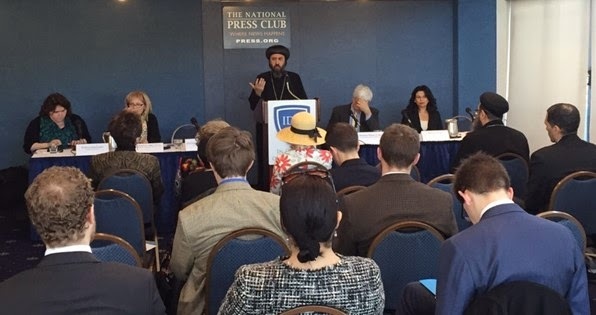 HG Bishop Angaelos met with a number of state representatives and officials in Washington DC and spoke at the National Press Club and the Hudson Institute on 17-18 March regarding the state of Christians in Egypt and the broader Middle East. 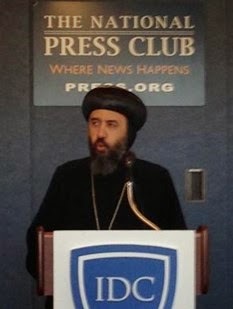 His Grace Bishop Angaelos, General Bishop of the Coptic Orthodox Church in the United Kingdom spoke to an audience of journalists, government representatives, NGO’s and media professionals at the National Press Club in Washington DC on ‘Sensitivity rather than sensationalism in media reporting’. After his address he responded to questions as part of a panel made up of Katrina Lantos Swett, President of the Lantos foundation, Robert A. Destro, Professor of Law and founding Director of the Interdisciplinary Program in Law & Religion at The Catholic University of America’s Columbus School of Law in Washington, D.C, Thomas Farr, Director of the Religious Freedom Project at Georgetown University’s Berkeley Center for Religion, Peace, and World Affairs, Journalist for the National Review, Kathryn Jean Lopez, and Nermien Riad of Coptic Orphans. In his address Bishop Angaelos shed light on the dangers of sensational reporting, and noted the power of journalism in influencing public opinion, generating reactions and directly impacting lives. 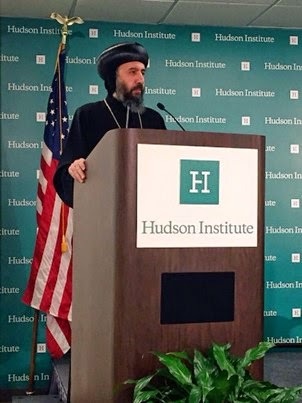 Later in the day His Grace gave a keynote address on the ‘Prospects for Christians in the Path of Persecution’ at the Hudson Institute. 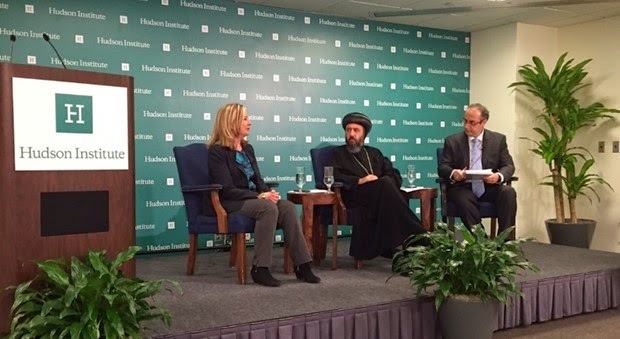 The session was chaired by Nina Shea, Director of the Centre for Religious Freedom at the Hudson Institute and Sam Tadros, Senior Fellow at the Center for Religious Freedom, Hudson Institute made a response to the address by His Grace. The panel then responded to questions from the audience, who were made up of government representatives, media professionals, and NGO’s. “The answer is not to empty the Middle East of its Christians nor to force them to remain in the region to maintain a presence, but to seek what they desire and enable them to fulfil their own choices, which will vary depending on many factors including where they live and what their experience is. As part of his visit to Washington, His Grace also met with Melissa Rogers, Special Assistant to the President and Executive Director of the White House Office of Faith-based and Neighborhood Partnerships. His Grace also attended a Congressional Hearing after which he met with Ambassador Saperstein, the State Department’s Ambassador-at-Large for International Religious Freedom. 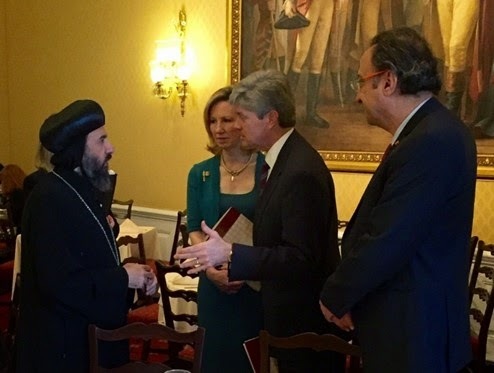 Bishop Angaelos’ engagements on 17 March included attending a Congressional Breakfast on Capitol Hill and meeting with Co-Chairs of the Middle East Religious Minorities Caucus, Congressman Jeff Fortenberry, and Congressdwoman Anna G. Eshoo. His Grace also met other members of the Caucus, including Congresswoman Barbara Comstock, Congressman Dave Trott, and Congressman Tim Walberg. During his visit Bishop Angaelos prayed a vespers service at St Mark's Coptic Orthodox Church and preached on the life of the Cross and the recent martyrdom of 21 Coptic men in Libya. The Coptic Orthodox Church Centre UK . Travel theme. Powered by Blogger.